Gurdeep Kaur, right, and her son sit on a bed below a picture of the slain family members. New Delhi, India (CNN) -- Gurdeep Kaur's wrinkled face was wet with tears, as she recounted what she saw a quarter century ago: the killings of 21 of family members. She recalled how maddened mobs barged into her home and burned alive her husband, two of her sons and a son-in-law because they were Sikhs, easily identified by their beards and turbans wrapped around their uncut hair as their faith required them. In her neighborhood in the Indian capital of New Delhi, many of her other relatives were among hundreds killed the same way and for the same reason on a single day, November 1, 1984. Thousands of Sikhs were lynched or burned alive in parts of India in the wake of the assassination of then-Prime Minister Indira Gandhi by her Sikh bodyguards. The attacks started in the evening of October 31 that year, when Gandhi was murdered, and went on until November 3. Amnesty International put the number of dead at "at least 3,000 Sikhs." Among the worst hit were Sikhs like Kaur, poor and marginalized from a community seen as economically stronger than other religious minorities in Hindu-majority India. Almost every family in New Delhi's Tilak Vihar -- a congested colony where Indian authorities resettled Kaur and numerous other homeless survivors of the 1984 attacks -- has a gory tale to tell from the bloody events, and from the destructive aftermath that followed for many Sikhs. Sitting beside her youngest son -- now 31 -- whom she was able to save from the attackers, Kaur's palms came together in supplication and thanks as she explained that he did not fall into drug use like many others of his generation who survived the attacks. Down on the narrow streets of this locality, residents lament what they call widespread addiction to drugs and alcohol. Kaur vouches for a case in her family. Her grandson -- from her daughter widowed in 1984 -- had to be sent to an addiction rehabilitation center. Just few blocks from Kaur's home, a widow remembers her 22-year-old son who died earlier this year, allegedly at the hands of a murderer. He, too, had been taking drugs but came off them after treatment, she says. "What happened in 1984 did not happen to one generation. It has taken a heavy toll on our progeny," remarked Mohan Singh, a 57-year-old survivor. "We lost about 150 of our young men to drugs alone." Most of the second-generation male residents at Tilak Vihar either drive three-wheeled motorized rickshaws or work as carpenters, electricians and auto mechanics, skills they acquired at the cost of full schooling. "I started working as an electrician when I was 15. 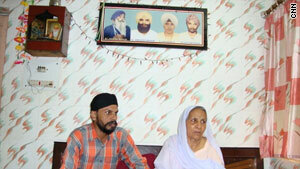 I had to drop out of school because of financial constraints," said Gurcharan Singh, Kaur's son. The father of two now works as an electrician at a college on a monthly wage equivalent to about $140. Indian authorities did compensate victims of the 1984 attacks with collective packages running into millions of dollars. Nonetheless, the survivors and political observers insist the successive governments did little to bring the perpetrators, alleged to include some powerful politicians, to justice. "What happened in 1984 was unfortunately part of an ultra-nationalistic approach of India's political establishment. It was the same approach that allowed killings of Muslims 18 years later," said veteran journalist Jaspal Singh Sidhu, referring to the killings of Sikhs in 1984 and of Muslims in the western state of Gujarat in 2002. India's Congress party is blamed for the events of 1984 while its opposition, Hindu nationalist Bharatiya Janata Party, faces allegations of supporting Muslim killings in Gujarat. "To date, there is no memorial to those who were killed for their religion in independent, democratic India. Yet, the occurrences of 1984 and 2002 are used by political parties to whip up passions and win votes in every national or state election," Sidhu remarked. For more than a decade since the 1980s, a fierce Sikh separatist movement swept through Punjab, India's Sikh majority state, over issues ranging from cultural to economic to religious in a country then governed by an overwhelmingly powerful Congress. Indira Gandhi -- mother-in-law of Italian-born Sonia Gandhi, who now heads Congress -- was killed almost four months after she ordered the storming of the Golden Temple, the holiest of the Sikh shrines, at Amritsar in Punjab, to flush out Sikh separatists. "I think at least the Congress party has now realized times have changed and that reconciliation is necessary for its survival and for its projection as India's party of the future," remarked K.G. Suresh, a long-time observer of Indian politics. "The choice of Manmohan Singh, a Sikh himself, as the country's first non-Hindu prime minister explains how it tried to build bridges," Suresh added. Twenty-one years after the Sikh killings, the Indian prime minister called the events of 1984 a "negation" of nationhood. "On behalf of our government, on behalf of the entire people of this country, I bow my head in shame that such thing took place," Prime Minister Manmohan Singh told the Indian parliament on August 12, 2005. "We cannot rewrite the past. But as human beings, we have the willpower, and we have the ability to write better future for all of us." But some analysts say independent India does need to undo its past. "It's an era of globalization. Economy, growth, development have overtaken passion as was evident in the recent national elections where people re-elected Congress," said Suresh. "Yet, I think we cannot build a bright future on the foundation of a dark past. We have to undo the wrongs of the past in order to be able to prevent recurrence of 1984 in any shape or form and against any culture or community. We have to deliver justice at least to those who suffered in a free Indian republic."